The Hollister Premier One-Piece Drainable Pouch Convex Flextend Barrier, manufactured by Hollister, is a drainable ostomy pouch that's designed with an integrated convex shape and ideal for people with recessed, retracted, or flush stomas. Constructed with a discharge-resistant skin barrier, this drainable ostomy pouch is specifically designed for extended wear. Simultaneously rustle-free and odor-free (via a sturdy odor-barrier), this drainable pouch is a great way to combat embarrassing odors and unnecessary pouch noises. Hollister Convex Flextend Barrier Premier Drainable Pouch is designed with a discharge-resistant skin barrier and tape border with a porous cloth adhesive, making it the ideal pouch for people with sensitive skin. 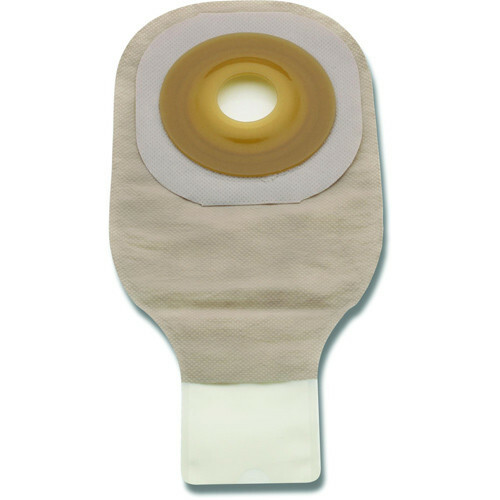 If you're searching for a pouch that's both gentle on the skin yet sturdy and odor-free, give this hassle-free convex ostomy pouch a try. You may also be interested in similar drainable ostomy pouch products and items, such as Assura Drainable Pouch Non Convex Standard Wear EasiClose Wide Outlet Maxi. Designed with an integrated convex shape that's ideal for people with recessed, retracted or flush stomas. Contains a discharge-resistant skin barrier that's specifically designed for extended wear. Drainable pouch features an odor-barrier and rustle-free film for protection from embarrassing odors and pouch noises. A ComfortWear panel on the body side of the pouch increases user comfort while wearing the bag. Hollister Product numbers: 8610, 8611, 8612, 8613, 8614, 8615, 8616, 8617, 8618, 8619, 86211, 8624, and 8628. This was beautifully precut to my exact size which saved a lot of time with all the cutting. Turns out they are a lot better at cutting the hole than I am! Shipping seemed a little slow but the Hollister 8616 is an excellent Colostomy Bag! This one is precut to my size which saved a lot of my cutting time. And the precut was beautifully done with a very smooth edge. Overall a very good item. I will buy more!